The Sepoy Mutiny of 1857 had been a landmark in the freedom struggle of India. I always believed it to be the first war of Independence, a direct fallout of oppressive colonial behavior. But, strangely there are not many movies or books solely based on that era, except of course Aamir’s Mangal Pandey. And, while every history book depicts Nana Saheb, Rani Laxmibai and Tatya Tope as the leaders, no one is quite sure about the actual reason for sudden flare up. However as I went through the blurb of Anish Sarkar’s Benaami, where the Mutiny was presented as the handiwork of a secret society, involved in ground level preparations and about to use a deadly weapon to secure freedom, I felt as if that void was about to be filled. Finally, I have laid my hands on a desi Bourne Sanction, about to track down the roots of an ancient mysterious cult! Though, the idea seemed far-fetched and almost unbelievable, my imagination was flared up. 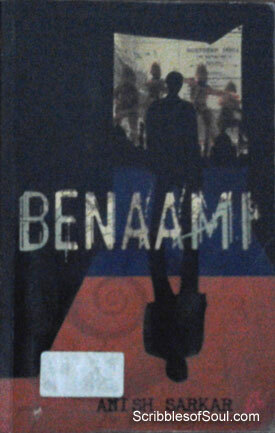 And, in a flash, I picked up ‘Benaami’ to devour a never-heard-before story. To begin with, the story revolves around an IT professional, Arjun Chatterjee, who suffers from nightmares about some people fighting with armed soldiers, in a smoke ridden ancient building. Arjun has a strong feeling that his dreams are not just imaginary visions, but are deeply rooted in reality, something scary hidden behind the hazy screen of long forgotten past. One day, he chances upon an article written by a History Professor of Jadavpur University, describing in some detail about a secret society, called Benaami (literally nameless), which was a major though hidden force behind the 1857 mutinty. Arjun is immediately struck by a strong feeling of deja vu, and decides to meet the Professor. But, the impulsive decision proves to be an eye opener, as the Journalist who actually wrote the said article is dead and the Professor is being stalked by a dangerous fellow. There seems to be a sinister angle associated with Benaami. However, the secret society was supposedly in existence some 150 years ago and is long dead. Then, why are innocent people being killed, especially those who are involved in the research on mutiny. Is there someone who is desperate to keep the secret hidden or is a greater conspiracy being hatched for selfish gains? As Arjun and Shiela join hands to dig deeper into history, Anish Sarkar creates a mesmerizing tale of mystery, suspense and drama in 364 pages of Benami! The first thing that struck me was the prologue, where two people, a young boy and a honey gatherer die, presumably in the vicinity of a boiling lake, surrounded by hideous caves and yellow colored mud. But, the two deaths had occurred with a time gap of almost 150 years, and no one is conscious of the reasons of their sudden demise, blaming demons and black magic. The intriguing prologue fired my curiosity and the first part of the novel added more fuel to it. The novel began really well. There were two parallel plots, one featuring Arjun and Shila in modern times, and the other with Kartik and Veer in 19th century. The story moved at a fast pace and the author kept introducing more characters to further entangle an already complex tale. The mystery was enhancing at every step and I was racing frantically to keep pace with the narrative, fearing for Shila’s safety and Arjun’s health. But, as soon as the second part began, something derailed in the narrative. I suddenly felt a downward slope, with plots appearing half hatched, timelines confusing, and the pace a bit too slow. To further add confusion, Anish made the same mistake as that of Eric in Bourne Sanction, he stretched a predictable climax into a long overhauled story, thereby losing his grip on my curiosity. Sadly, the mystery element evaporated much before the actual end! And, as I think back, I believe the basic idea on which the entire suspense was hinged, is actually too easily discernible for the modern Hollywood smitten conscious readers. Another small irritant that kept nagging me, was the extensive use of Italic Font for the story of Kartik. Though, it looks aesthetically pleasing for a few highlighted phrases, but to write entire chapters in this font was an overkill. It hurt my eyes and made the slightly didactic history of 1857 even more dreary. But, nevertheless, I liked the novel, at least in the beginning, where groundwork was laid in a firm yet inviting manner. Each chapter left me craving for more. And, the narrative was terse yet refreshing, creating ample opportunity for romance, violence and altruism at regular intervals. All in all, a good debut novel by Anish Sarkar, though I would have loved to see more suspense and a more convincing climax to a well begun tale!